Ravelry.com (for knitters and crocheters) is a fantastic example of a thriving niche social network. It has over 1.4 million members (and my wife loves it: she spends more time in there than on Twitter or Facebook). A recent article about Ravelry in Slate talks about how “social sites work better when they’re smaller and bespoke, created to cater to a specific group.” Members share photos and swap tips on their knitting projects. The site was started by a husband & wife team, and now has a 4-person staff. Revenue comes from their online store and advertisers. Ravelry benefits from the enthusiasm of its many knitters, and there’s strong a sense of supportiveness. Knitters like to talk about the esoterica of yarns and patterns; Ravelry gives them a place to browse and discuss thousands of design instructions and yarns uploaded by members, share photos of their projects, commiserate about minor goofs in their knitting, find answers to basic or technical questions, get ideas for future projects, and discuss anything from miscarriages to cats. Ravelry does not integrate with other sites like Facebook or Twitter, but members can integrate it with their blogs and display their (knitting) blogs’ feeds in their Ravelry profiles, and Ravelry shows how many blog posts have mentioned a pattern. If your organization is thinking about making a new social network for likeminded educators, scientists, or professionals, or enthusiasts, a useful model is ExhibitFiles (for exhibit designers and developers). This network has 1945 members, who have shared 383 case studies and reviews of exhibits, and can connect to each other. Seed funding came from NSF, and it is now run by the Association of Science-Technology Centers (ASTC). Their revenue is solely a grant from NSF’s Informal Science Education office. 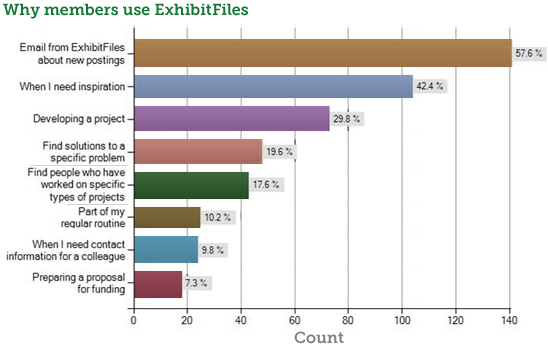 In 2007-2008, Exhibit files realized that some members wanted to share more than just case studies and reviews. In October 2008, they announced plans to add short message or media elements, and in July 2010, they rolled out the new feature, called “bits.” There have been 62 small bits contributed in the last year. Also, ExhibitFiles has actively blogged, adding posts every 2-3 weeks to a secondary section of their site. Who are their members? The addressable market of exhibit designers is much smaller than knitters, and ExhibitFiles has 1/1000 the membership of Ravelry. ExhibitFiles members range from senior professionals (25%), to experienced professionals (55%), to entry level (15%) and students (5%). (Based on early 2010 survey; N=286; response rate of 22%). The members work at science-technology museums (23%), at private firms (17%), cultural museums (10%), academia (9%), companies (8%), zoos/aquariums or nature centers (5%), natural history museums (4%), childrens museums (4%), nonprofits (3%), and the rest for agencies, other public education institutions, and others. Market penetration. They have approximately 450 members at science museums, which compares well to the Association of Science-Technology Centers database of 400 science centers and museums worldwide. Membership is weak for other disciplines. The 2010 edition of Museums of the World, published by De Gruyter Saur, lists 55,000 museums in 202 countries. The American Association of Museums estimates there are 17,500 museums in the U.S.
Why isn’t there more sharing? Exhibit designers have a common goal of public education, they have a lot in common, so why don’t they network? Perhaps it’s because it’s a tight job and funding market, and they are competitors. Perhaps institutions fear embarrassment or reprisals from funders or the public if they share their evaluations as case studies. The site has had technical flaws (slowness, downtime and spam), but that does not explain a low percentage use of social networking. Fundamentally, members do not feel motivated to share, nor to connect. Wingu building a enterprise-grade cloud platform dubbed Elements that will enable research teams to collaborate more effectively and use data in ‘new ways.’ According to the Washington Post, Wingu is funded by Google Ventures. Mendeley (got $2M early stage funding, claims over 1M members). UniPHY is run by AIP, and they preloaded the site with over 300k profiles from researchers who have 3 or more papers in AIP journals. COSIS.net is a members-only network intended for scientists and their affiliated organizations, not very active. There are many more. But if you want to start a new niche site, start by looking at what Ravelry and ExhibitFiles have done well. If you have comments about what makes a niche social network successful or a failure, comment below. Also share any other good examples.